True North Equity (TNE) is a private equity firm located in Birmingham, MI. Our current investment focus is in acquiring U.S. and Canadian-based companies that perform outsourced services in support of refineries, petrochemical and power plants, and oil and gas production. Targeted EBITDA levels range from $5M-$20M, although both smaller and larger opportunities may be considered on a case-by-case basis. Investment from TNE brings business owners liquidity, as well as capital for growth - whether it be organic or through acquisitions. We look to partner with strong management teams focused on the continued growth of the business. Members of management are encouraged to invest alongside TNE, providing the team an opportunity to participate in equity gains during our holding period. We understand the unique challenges that can be involved in the sale of a company. With this in mind, creative transaction structures can be developed with the flexibility to best fit the financial, legal, and tax needs of the shareholders. If you are a business owner looking to sell your company, or an intermediary representing a seller, please review our Acquisition Criteria page to see if your business fits our focus. EBITDA of $5M-$20M, although smaller and larger opportunities may be considered on a case-by-case basis. Companies involved in cleaning, maintenance, repair, or other services in support of refineries, petrochemical and power plants, and oil and gas production. Only majority equity ownership opportunities will be pursued. Primarily healthy companies, although underperforming businesses with the opportunity for operational improvement will be considered on a case-by-case basis. Turnarounds will not be considered. TNE strongly prefers situations where the management team continues to run the day-to-day operations, but may also invest in businesses where the management team wishes to leave the company post-acquisition. Jeff Wigginton founded True North Equity in 2008. At TNE, he is responsible for all phases of the investment process, from deal sourcing and evaluation, to due diligence, negotiations, and securing acquisition financing. He is also involved in the operations of portfolio investments, typically holding both an executive and board level position with the companies. Jeff received an MBA from The University of Chicago Graduate School of Business, and BBA from Eastern Michigan University. His interests include golf, reading, and travel - with highlights including scuba diving in Belize, bungee jumping from a bridge in New Zealand, skydiving in Hawaii, visiting the Great Wall of China, traveling the Amazon river basin, and reaching the summit of Mt. Kilimanjaro. Jim joined TNE in 2010. In addition to his role with TNE, Jim is a Board Member of Inland Pipe Rehabilitation, LLC. He is formerly the CEO and Board Member of TNE portfolio company PowerTeam Services, LLC. Over a career spanning 40 years, Jim has assisted more than 100 under-performing companies and companies in turnaround situations in a wide variety of industries. He served as the CEO of The Ronin Group, a consulting firm focused on turnaround situations. Before that, Jim acquired, improved and sold a dozen operating companies in the automotive, packaging, industrial service and technology industries. He also spent a decade with Omnicare, Inc. (a $2.5 billion NYSE health care company) in various positions, culminating as Chief Operating Officer and Director of the company. Jim earned a Bachelor of Business Administration degree in Finance and a Masters of Business Administration degree with a concentration in Marketing from Eastern Michigan University. He has also completed the Executive Program at Stanford Graduate School of Business and attended The Peter F. Drucker Graduate School of Management. Jim was actively involved with the U.S. Olympic program from 1972 to 1995, representing the United States as a coach/ trainer of the U.S. National Taekwondo team. Dedicated to community involvement, he was with the Red Cross in New York City immediately after the September 11th tragedy in 2001. 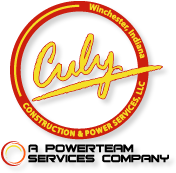 Culy Construction & Excavating, LLC. Acquired by PowerTeam Services, LLC. Periculum Capital Company, LLC (“Periculum”) is pleased to announce the sale of Culy Construction & Excavating, Inc. (“Culy” or the “Company”) to PowerTeam Services, LLC (“PowerTeam”) a portfolio company of Kelso & Company (“Kelso”). Periculum acted as the exclusive financial advisor to Culy in connection with the sale of the Company. The Riverside Company (Riverside) and True North Equity, LLC (True North) have established IFS Group (IFS), a new platform holding company that will specialize in providing non-discretionary industrial and field services supporting power generation and process industries. Riverside and True North simultaneously invested in Summit Environmental Services (Summit), a leading regional provider of outsourced industrial cleaning, excavation, and field services for customers located primarily in the Mid-Atlantic and Midwest. Riverside and True North partnered with Summit management in the investment. PowerTeam Services, LLC (PowerTeam), a portfolio company of Kelso & Co. (Kelso), a private equity firm based in New York, NY, and Birmingham, MI - based True North Equity, LLC (TNE), has acquired East Coast Underground, Inc. (ECU), based in Hurlock, MD. ECU is a leading provider of outsourced maintenance, repair and installation services for blue-chip, electric utilities in Maryland and Delaware. ECU is the seventh business to join PowerTeam, a super-regional utility services company. Jeff Wigginton, founder and managing partner of True North Equity, made the announcement. Plymouth-based PowerTeam Services LLC, which provides services for natural gas and electric utility companies, will double its revenue to $500 million when an acquisition that will bring the company under a new majority owner closes May 6. PowerTeam's majority owner is CIVC Partners LP of Chicago, with Plymouth-based True North Equity LLC as the minority owner. The impending deal was financed with $525 million in debt and involves New York City-based Kelso & Co. buying out CIVC's stake in PowerTeam and some of True North's stake. POWERTEAM SERVICES ACQUIRES DISTRIBUTION CONSTRUCTION CO.
PowerTeam Services, LLC (PTS) of Plymouth, MI has acquired Distribution Construction, LLC (DC), of Greensboro, NC. PowerTeam is a portfolio company of private equity firms True North Equity, LLC (TNE), and CIVC Partners (CIVC). Jeff Wigginton, founder and managing partner of True North Equity and COO of PowerTeam, made the announcement. True North Equity, a private equity firm based in Plymouth, Mich., along with Chicago, Ill.-based CIVC Partners (CIVC), has acquired The Brewer Company’s Utility Services Division (BUD), based in Cincinnati, Ohio. BUD is a leading provider of outsourced maintenance, repair and installation services for blue-chip, natural gas utilities in Ohio and Kentucky. BUD is the third business to join PowerTeam Services, LLC (PowerTeam), a multi-regional utility services company. Jeff Wigginton, founder and managing partner of True North Equity and PowerTeam, made the announcement. Jeff Wigginton, who has an MBA from the Booth School of Business at the University of Chicago and is a former principal at the Birmingham private equity firm of Strength Capital Partners LLC, had the entrepreneurial bug. And a vision. He wanted to own his own private equity firm and do his own deals. The problem was, he didn’t have a fund raised when he founded his firm at the beginning of 2008. And, though he wouldn’t know it for a few months, the economy was about to take a nosedive that would make fundraising impossible. True North Equity, a private equity firm based in Plymouth, Mich., along with Chicago, Ill.-based CIVC Partners (CIVC), has acquired a controlling interest in Conyers, Ga.-headquartered Southeast Connections, LLC (SEC), the leading provider of outsourced maintenance, repair and installation services for blue-chip, natural gas utilities in the Southeast. SEC is the second business to join PowerTeam Services, LLC (PowerTeam), a multi-regional, utility services company. Jeff Wigginton, founder and managing partner of True North Equity and PowerTeam, made the announcement. True North Equity LLC, a private-equity company that opened its headquarters in Plymouth in August, has closed on its first deal, which is to join with CIVC PartnersLP of Chicago to buy a controlling interest in KS Energy Services Inc. of New Berlin, Wis.
Jeff Wigginton, the managing partner at True North who previously was a principal at Birmingham-based Strength Capital Partners LLC, said the deal was for between $50 million and $75 million, which is the same range for KS revenue.